This entry was posted on June 6, 2010 at 2:19 pm	and is filed under aspgems, javier ramirez, madrid. 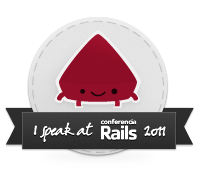 Tagged: aspgems, javier ramirez, ruby madrid, ruby on rails. You can follow any responses to this entry through the RSS 2.0 feed. You can leave a response, or trackback from your own site. Heya! Can i consult what exactly is involving web template a person using regarding web site? anyone. the idea charge significantly to be able to weblog? Please allow me to introduce myself for the first time. I am Sadhana, the Business Development Manager for COB Technologies. I am here to focus on acquiring and understanding your business needs and nurturing you with the outstanding talent we have which will generate and sustain significant and beneficial growth to your organization maintaining the quality. Here is a little more information on our services and center in India, with a wide variety of skills, and a 6 day standard workweek. You can actually set up a Virtual Office (also known as ODC = offshore development center) within our centers and the assigned developer(s) will be dedicated employees to you and report directly to you on a full time basis. You are able to communicate any time with them by VOIP Lines, IM, Email and free Skype sanasana3025 and you can monitor them. A number of genuinely beneficial information in this article. I am not really sure whether you are aware or not but it does look like your footer is actually overlapping a lttle bit. Must be a specific program inside the code not really quite right. Nevertheless, great web log you own here and you definitely can’t beat wordpress blogs for a Website cms program. of a noob! However have found your site very good and instructive.